The staggering sales success of The Priests (number five in the UK album charts) with their self-titled debut album has well and truly shaken the music industry and particularly those who have long thought that religious music has no sales appeal in today's modern world. The brainchild of producer Mike Hedges, who has also worked with U2 and the Manic Street Preachers, the three middle-aged Roman Catholic priests do indeed seem the most unlikely of hitmaking acts. 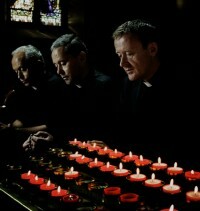 The Priests' uplifting renditions of Catholic favourites like "Ave Maria", "O Holy Night" and "Benedictus" have captured a worldwide audience and have shown that the one point one billion Catholics worldwide is a hugely untapped market. The Priests consist of Father Eugene O'Hagan of the Parish of Ballyclare and Ballygowan: Church of The Sacred Heart and Church of The Holy Family, Diocese of Down and Connor; Father Martin O'Hagan of the Parish of Cushendun: Church of St Patrick (Craigagh), Church of St Mary, The Star of the Sea (Culraney), Diocese of Down and Connor; and Father David Delargy of the Parish of Hannahstown: Church of St Joseph and Church of St Peter, the Rock, Diocese of Down and Connor. It was at St MacNissi's College near Carnlough in Co Antrim, where the trio met for the first time and began to recognise their musical prowess as a singing group. "Singing was the least manly thing to do at a boys' boarding school,' recalled Eugene, who has three sisters and another brother who has not followed him into the clergy. "I tried to play rugby but had two left feet." Nicknamed Holy Holy Holy by their peers due to their shared determination to enter the priesthood, it was a priest at their school who first noticed how talented they actually were. After leaving St MacNissi's, they followed their vocation training at The Seminary in Belfast, where Fr Eugene specialised in English and Scholastic Philosophy and Fr Martin and Fr David specialised in Ancient History and Scholastic Philosophy. During that time they all studied under the Belfast-based singing teacher Mr Frank Capper MBE. The Priests concluded their training at the revered Irish College in Rome where Fr Eugene studied for seven years, Fr Martin five years and Fr David for four years. Whilst in Rome Eugene took advantage of the fact that he was able to have signing lessons from Sergio Ballani. Almost immediately their combined and rare talent was recognised. They were invited in person by the Pope's private secretary, Monsignor John Magee (the Papal Master of Ceremonies) to sing for the Pope in the sacred liturgy. The Priests' careers overlapped once again as they all eventually returned to Ireland, where they began their work in various special ministries. Each now lives the life of a full time parish priest, tending the spiritual needs of their parishioners and official duties at all church services including those to mark the christenings, marriages and funerals of members of their catholic community. It was record producer Mike Hedges who spotted The Priests' sales potential. A former Jesuit choirboy himself, Hedges' dream was simple: he wanted to record a commercially successfully version of the Latin Mass. He put his plan to Nick Raphael, MD of Sony's Epic Records, who, after much deliberation, sent out talent scouts to find suitable voices. It was the head of music at St Columb's College in Derry who recommended the O'Hagan brothers, Fathers Eugene, 48, and Martin, 45, both tenors, plus Father David, a baritone. Friends since they met at boarding school 35 years ago, the three had long enjoyed amateur singing in between their parish duties. Signed to Sony Records The Priests' album was made with a huge recording budget (including sessions in Rome) followed by a David Bailey-shot album cover and a massive promotional campaign. Even with all that though, the sales 'The Priests' achieved has shaken the music industry with the album selling well over a million copies and in Ireland going quadruple platinum. Despite the publicity frenzy surrounding the trio, the group remain level-headed. Said Fr David, ""Showbiz life is only what you see through glossy magazines," Father David says gently. "I don't think that it's half as glitzy as presented. I guess they have challenges to their lives that we don't have - and those lives don't always bring happiness. I get the impression that people in the music business work very, very hard. Sony is a place full of human beings with mortgages, and with children to get up in the morning. It's stressful and pressurised and they eat at unusual times. Anyway, the only celebrities I have ever seen were in hotel corridors." Recently the Sunday Times asked Fr David whether the process of making the album had involved any temptations? He responded, "Sometimes, you do have a 'grass is greener' experience. But life isn't a bed of roses, whatever path you take; and as life goes by, you grow into your life. I have always been secure that this was what God was calling me to do." Father Eugene, who seems more intrigued by the showbiz world, insists that he is content with the path he chose at 18. "I listen to, and have read about, the careers of many singers and actors. Like us, they incorporate their gifts into the humdrum of life. At the end, none of us can live at the height of the mountain all the time. Anyway, sometimes the humdrum is quite pleasant." The opportunity to sing to a wider audience has come about by divine providence, he believes. "We look at things through the prism of faith. An opportunity comes your way - and it doesn't occur for no reason. You take a risk. Sometimes, the opportunity is worth it, because it is enriching." Thanks for your explanation, Moira. Your comments do help me better understand what Catholics believe. But I can't say I'm wholly convinced, because I believe in the Protestant doctrine of Sola Scriptura (the Bible is sufficient) - whereas church teaching and tradition is secondary - so cannot accept doctrines like the Assumption and Immaculate Conception which are not found in the Bible. And some, but not all, Catholics seem to elevate Mary into a god-like position. It is a fine line between idolising and idolatry, and sometimes it is crossed in relation to Mary. That said, we Protestants should do more to highlight the great example of Mary, and I am intrigued by the idea of Mary as a new Eve - something I'd not thought about before. That certainly brings a completeness to the Bible's redemption history from a female perspective. However, I'm uncomfortable with the idea of Catholics praying to Mary or any of the saints - as Barry Boyers said, the Bible says we have one intercessor for us with the Father and one mediator of our salvation - Jesus. Nowhere will you find the NT Christians praying to anyone except God the Father, Son and Holy Spirit - no mention of a 'Queen Mother' or praying to OT saints. Can you enlighten me further about how this is justified by Catholics? I would like to find out the English translation for Ave Maria. Is it not worship of Mary? The catholic church elevate Mary far beyond what the bible teaches. For instance they say she was born without sin (doctrine of Immaculate Conception) when Mary herself confesses God is her Saviour and Mary is a mediator between us and Jesus (No mediator between God and man except Jesus) + many other things could be commented on. The Ave Maria is the "Hail Mary" in Latin. It is veneration not worship, in the words of the Angel Gabriel and her cousin Elizabeth. The first part is: “Hail Mary full of grace, the Lord is with you, blessed are you among women, and blessed is the fruit of your womb, Jesus”. The second part is our traditional prayer to the 'Queen Mother' of Heaven and Earth (mother of our Lord and King Jesus Christ) : “Holy Mary, Mother of God, Pray for us, sinners, now and at the hour of our death.” Mary was redeemed by virtue of her 'Yes' to accepting the motherhood of the Son of God and a unique place in Salvation History, and by the Cross. We acknowledge her role at the foot of the cross, and indeed in Heaven now. She is our prototype. The new Eve: totally united to the Will of God, without reservation. We should emulate Our Lord - but sometimes His Divinity seems to make emulation impossible. But Mary was like us - not divine - and we can look to her contemplation and acceptance as an ideal we can achieve. The Catholic Church doesn't rely on Scripture alone - but also the Tradition which produced the NT – oral and practice. The Blessed Virgin remained with John for many years, and early Christians held her in the highest regard. This tradition passed down through the ages, not only in the Catholic church. Muslims also venerate and honour her. Many travelled to Ephesus when she died - a very special death we call the 'dormition' of Mary - and witnessed the fact of the Assumption. She has the most unique relationship with the Blessed Trinity: Mother of the Son, Daughter of the Father and Spouse of the Holy Spirit. Yes of course she intercedes for us. Christ himself gave us to her from the cross, as her children, and gave her to us as a loving Mother. We don't 'need' her to reach our Lord. Fortunately God grants us an abundance of gifts many of which are not 'necessities' but the overwhelming grace of His abundant Love. Such is Mary. I hope that helps.